There’s an interesting new mechanical keyboard about to enter the fray by a maker called Drevo. Launched on Kickstarter only yesterday with a funding goal of US$20,000 the project has already easily surpassed that with over $25,000 in its back pocket. 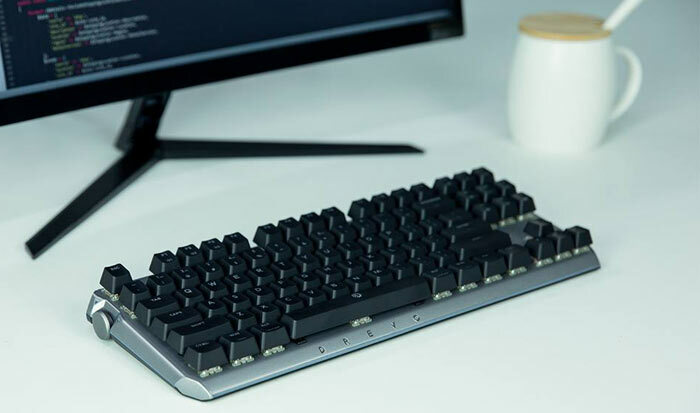 In brief, the new mechanical keyboard, aimed at gamers, includes features such as a programmable knob, choice of RGB Cherry or Gateron switches, Wired or wireless operation, on-board memory and more. 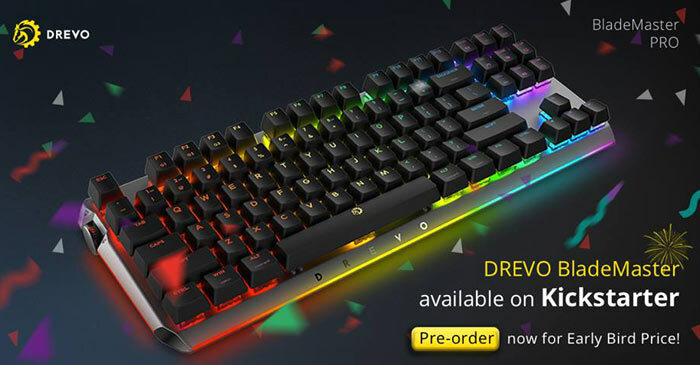 This version of Drevo’s new gaming keyboard features a “superior typing experience” thanks to the use of Cherry MX RGB switches with a choice of feel-type between red, brown, black and silver. It can connect to your systems via Bluetooth 4, 2.4GHz (1ms/1000Hz) Wireless or USB. Three devices can be connected at one time. A 4,000mAh battery is equipped and the USB cable is detachabale. This board is still available on an early bird deal for $99. Drevo have a cheaper version of the Blademaster, the TE edition. This is a captive cablke wired only model and comes with mechanical switches from Gateron with your choice of red, blue, brown or black key-feel types. You can still nab an early bird offer on one of these keyboards for $55. Both of the above models can be requested with US/UK/IT/DE/FR/SP/JP/KR layouts. The programmable Genius Knob – this knob, clearly pictured above, responds to turning in both directions and it is clickable. By default it is programmed as PageUp, PageDown, Home (click) and End (double click). 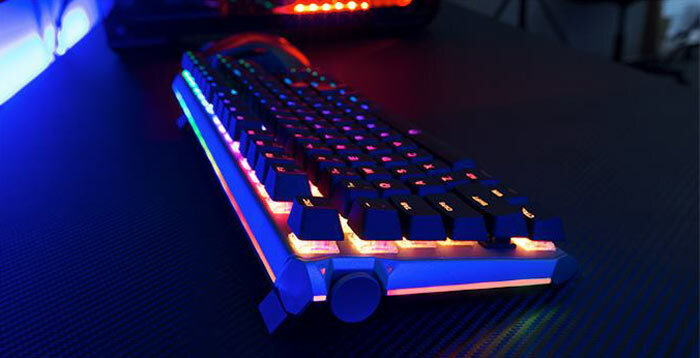 Drevo Power Console – Cloud enabled software allows you to adjust all the keyboard parameters, Genius Knob, macros, RGB lighting, game presets and more. OS support: Blademaster supports all features on Windows 7+ and Mac and is usable with other OSes such as Linux, Android and iOS. Storage on board – There is internal storage so you can save three custom settings sets and recall them without extra software. If you are interested in the Drevo Blademaster keyboards the project still has many weeks to run but the early bird offers could possibly run out. After the Kickstarter project closes, mass production is scheduled for July, with shipping and software delivery expected in August. Drevo's product is by no way the first gaming keyboard to equip a knob, dial, roller, or slider type control. Only a month ago we saw Roccat release the Horde Aimo Membranical keyboard with a tactile dial to the upper right, above the numpad. This dial is multifunctional and can be used for fast intuitive control of illumination, brightness, dpi, volume and more. Furthermore, Roccat’s device is compatible with Windows 10 Dial functionality. It includes a programmable knob. Really not a fan of this Corsairy keyboard style. Looks like a piece of LEGO™. Would be nice to have other features for that price, like extra macro keys and so on. I agree with Ttaskmaster - looks like a major dust/crumb collector. I can't help thinking it looks like the CPU from the first Terminator. IIRC, that's the one thing it's good for… in that it's easy to clean around the keys, as well as easy to pop them off…? Build quality will be superb though, if their other offerings are anything to go by. I got a Drevo Excalibur mechanical keyboard last year, and it's a fine piece of kit. Very impressive for the price. I agree, I've had my Drevo Tryfing 88 for a while now and I'm very happy with it.